Procrastination is probably the number one enemy of the creative process. But beyond procrastination, another crippling enemy of progress is the lack of focus. Task Baton was an idea that was born from Micah Jackson's personal struggle to stay focused on tasks and ensuring their completion. Task Baton combines several key elements, which when used together, provide an effective means for the completion of tasks. The three main components of the Task Baton system include: The Task Baton board, a mobile application and the Task Baton dispenser. 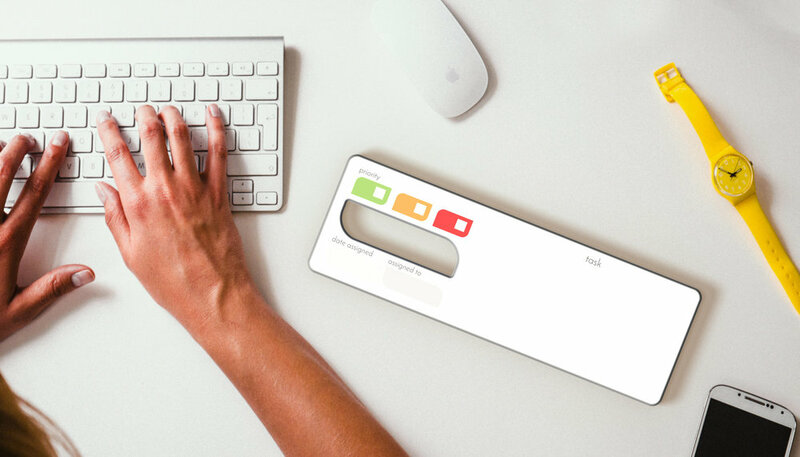 When used properly, these three components will provide users with a physical reminder, visual reminder and a psychological reminder of the task. In short, Task Baton is both a physical product and a method for tracking and assigning accountability for individual tasks. The system is very simple, you write the task on the Task Baton and hand it to someone. This simple act of assigning physical "weight" to a task gives it a tangible, real-world value. This transforms the task from being an abstract idea or directive into being something that occupies the real-world. When this physical task is handed to another person, an informal "contract" is implied. The simple action of handing someone a physical object to represent a task, greatly improves its chances of being completed. The Task Baton was initially mocked-up using cardboard and further engineered in Photoshop. The proportions and measurements were key to making the Task Baton effective in its duty. It must be large enough to have "presence" so that it wouldn't be ignored, yet it must fit in most people's hands. After the dimensions and design were finalized, Micah generated a 3D model of the Task Baton, which was later printed from colored sandstone. The prototype is the first step to a limited run of Task Batons which will be tested in the real world.